Ted thinks that this was taken by H. Gordon Tidey. But where is it? The passenger train is pulled by a Dreadnought compound, (we think), and the engine seems to have a square headboard. Beyond the train the line curves to the left. Could the location be just after Conway and before the camp at Conway Morfa? My thinking is that the railway did run parallel to the A55 road at this point. The bridge in the background looks similar to the bridge into a housing estate, and if I am correct Gordon Tidey would be standing on the LNWR footbridge taking the photograph. 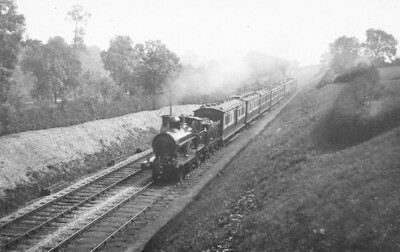 Dreadnoughts were to be seen on the North Wales lines round the late 1890s. I have attached the nearest photograph I have, to compare topography and so on, being between Penmaenbach Tunnel and Penmaenmawr. If the engine is a Dreadnought the latest possible date of the photo is July 1905 (last survivor). But the second carriage appears to be a WCJS 47ft 9in First Class Dining Saloon to P1. These remained in the WCJS fleet until the summer of 1905 when they were transferred to the LNWR. So a location on the North Wales coast line seems very improbable and there seems to be an absence of mountains. I have no real idea, but at a guess would offer somewhere south of Hartford on the WCML, or Carwardine Cutting near Armitage (still double track only at that date)? The coaches behind the dining saloon appear to be 8ft 6ins wide, so WCJS. But the leading vehicle, 8ft 0in wide and with centre guard, is LNWR. Another possible location is on the Down Fast line approaching Watford Tunnel. The cutting for the slow lines is in the background, with a telegraph pole visible. In my records of over 5,500 Tidey pictures there are only 2 Dreadnoughts, one at Euston the other at Hooton. If this view is indeed North Wales in the 1890s I think it is too early for Tidey - I can find nothing of his in the area before around 1912. I cannot agree with the suggestion that this is near Conwy. The angle of repose of the embankments, length of straight track and the general background do not match the suggested location (which is fairly local to me). Beyond that I havn't a clue. I doubt that it is the Down Fast approaching Watford Tunnel. The fast lines are perfectly straight from Watford Junction to the tunnels, and only curve north of the tunnel. Sorry that I can't suggest where it might be except to say that it looked a little like the section south of Bay Horse (Preston to Lancaster) - nothing definite, just a feeling! This debate has been adjourned to the society's forum because of the links with Mystery Picture no. 72 and the submission of further photographic evidence. The relevant discussion is here.